Chorizo is one of those very rare ingredients that gets along with anything in its vicinity – food or otherwise (except perhaps pigs). 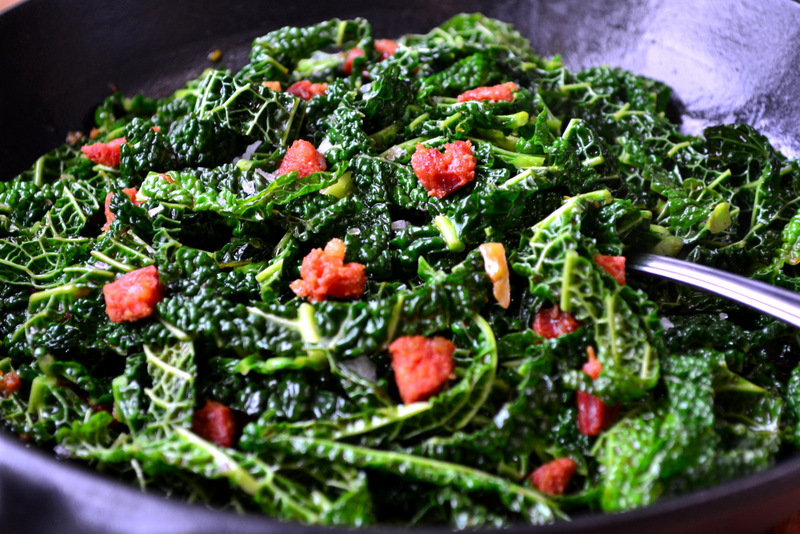 Not only does chorizo accompany kale to pleasing effect, it is suited rather handsomely to cabbage. This naturally leads one to suspect that our spicy Spanish friend could be bosom buddies with the entire brassica clan – all should be revealed in time. Meanwhile, why not make the time to appreciate the deep hues and rich flavours which accompany these wonderful ingredients? As you may have noticed, cabbage and I are getting along famously. No longer is ‘blasted’ permanently prefixed to the names of each member of the brassica family – prepare them correctly and each and every green cousin is simply divine. Indeed, it is my firmly held belief that to pan-fry a leaf of cabbage or a floret of broccoli is to transform it into something heavenly. Steaming is also acceptable, but boiling seems to steal any vibrancy from greens – though this doesn’t apply so much to red cabbage. It may seem strange, but when coasted with the richness of chorizo the subtlety of cabbage is truly allowed to sing and does a spectacular job of underpinning the strength of the sausage. Additionally, the interesting and pleasant texture of savoy cabbage adds a little intrigue to the dish, allowing it to play with numerous senses. 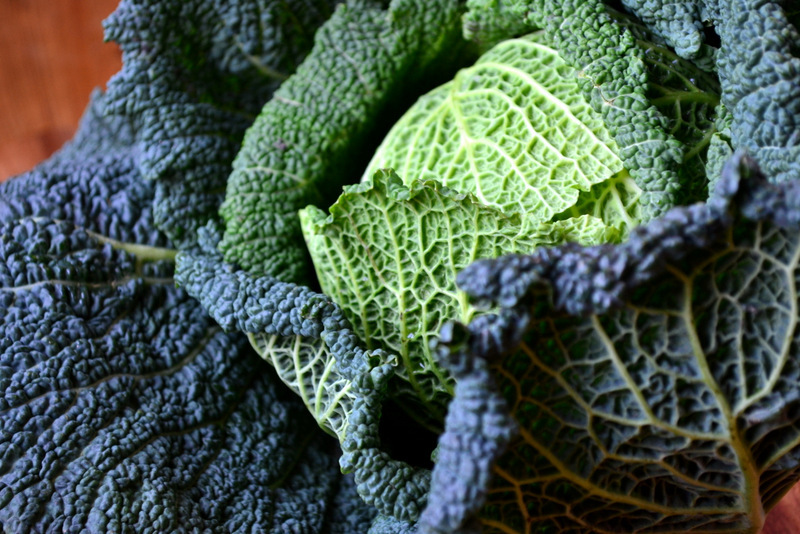 If you’re keen on making full use of the textural qualities of savoy cabbage try to use the heavily patterned and richly colourful outer leaves – they will serve to enhance one’s enjoyment. If you happen to live in Bristol, Source in St Nicholas Market is a great place from which to buy quality, well-sourced chorizo. You can pick up one sausage for around 90p. 1. 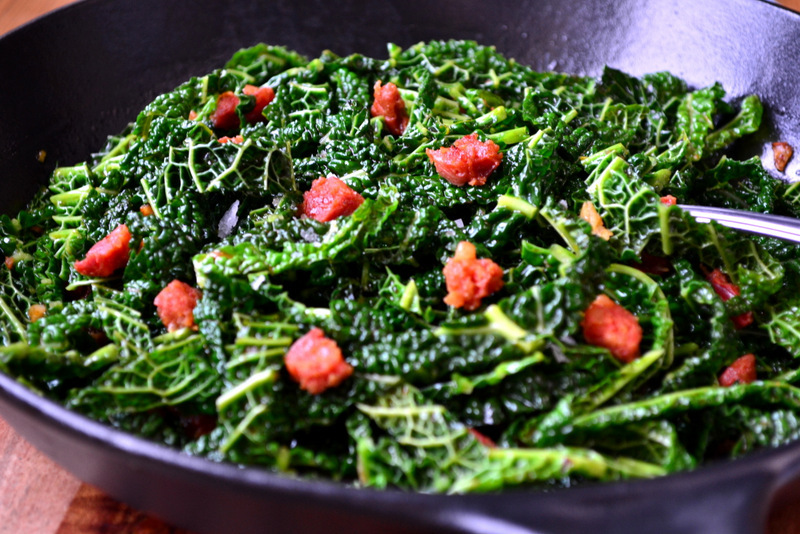 Gently fry the chorizo and garlic in a healthy dose of olive oil, enough to coat the cabbage. Cook until the chorizo begins to release its fat and colours the oil. 2. Turn the temperature up and then add the cabbage. Cook for a few minutes giving the cabbage time to warm through and begin to cook. Make sure it’s covered in the delicious paprika flavoured oil, scatter with the sage and serve immediately with bread. Cost: Cabbage is extremely cheap, particularly at this time of the year when it is in season. The entire brassica set me back 95p and I probably only used around a quarter of it here. All in, this dish set us back around £1 – a great price for a delicious lunch. I agree with you about chorizo — in fact, I call it “the bacon of sausages.” It improves almost anything! That cabbage is just beautiful. 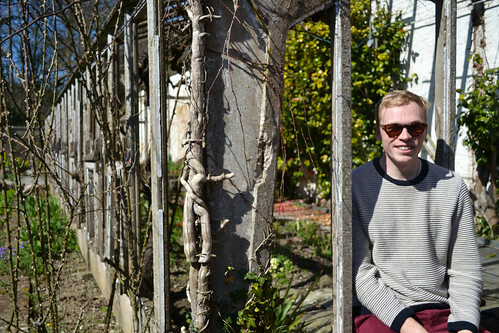 Lovely photos, Frugal. What interesting cabbage, ours isn’t nearly as dimpled. Makes me wonder if the texture is more like kale. Hmmm – in some ways I guess. Isn’t it spectacular? Made a version of your cabbage kale pasta but with broccoli kale and quinoa- it was so yummy must try this. Cabbage and pork? What’s not to love? Looks great. I still have lots of chorizo too from my sausage making sessions last Autumn – thanks for inspiring me to cook something that isn’t going to cost me anything! Think my cabbages may be a tad frozen though. This is one of my all time favourite things to do with this type of cabbage – but I usually use lardons rather than chorizo. Thanks again for a inspiring twist! 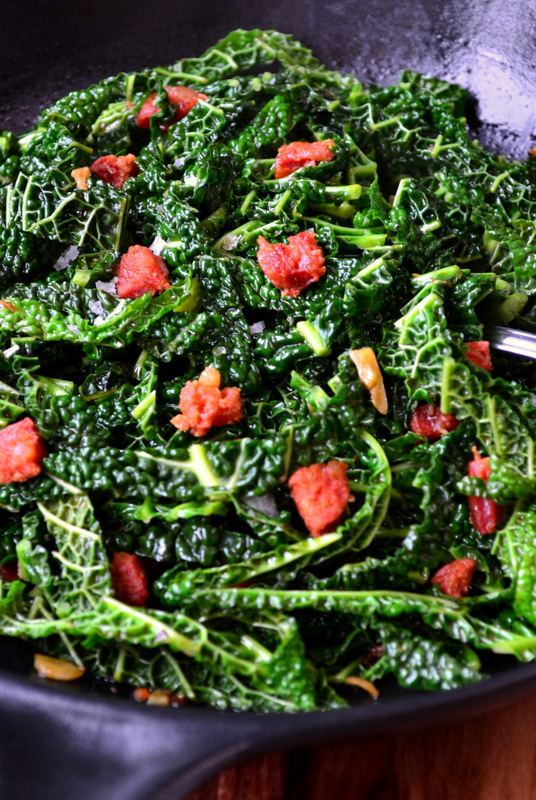 Best of both world here — spicy meat and leafy greens. Great job, man! Reminds me of a spanish tapas… chorizo makes everything better. It did have that feel about it, Aimee! I wouldn’t have thought of this combo. Glad you did! For me chorizo is like bacon – you can throw it into anything and it will be amazing! Love the look of this. Did you have this as a side or a mail? Definitely! We had it for lunch with bread and a little cheese, I recall. This looks so good! I would have never thought to put chorizo and cabbage together, but it sounds wonderful. Any kind of dark green veg and salty pork product is pretty divine combined. I love cabbage with chorizo so this is right up my street, yum! Indeed it is, Loaf! Glad you like it. I adore Savoy cabbage and often make this in Spain like you with Chirizo or with jamon (and sometimes a Little sprinkle of smoked pimentón becuase it´s my current craze)! Oops Chorizo – you´d think I´d know how to spell that! Ooooh yes, jamon… yes please. Id say these are great together, yummy! A nice twist on bacon and cabbage. Two foods that are made for each other. Chorizo makes anything taste better. I use it all the time! When figs are in season in NY I wanted to see how the figs and chopped chorizo would go together. Sweet and salty. I agree, chorizo is one of those things that makes anything taste good, kind of like cheese sauce or garlic butter. Indeed! It’s one of my favourites! A tasty and healthy meal! Looks wonderful !! Fabulous recipe! I have a head of cabbage sitting in my fridge and I was looking for a new way to prepare it. I think I will give this a try. Please do – it’s delicious. Love this recipe – looks amazingly yummy! You may have just convinced me into liking cooked cabbage ! Your photos are gorgeous! Looks delish! What happened to the sage? My apologies – all fixed now. Thanks for picking up on the error.